We’ve all seen kids in a candy store, right? Well, that’s me at my late-August farmers market, surrounded by Midwest sweet corn, giddy with possibilities. For today’s edition of Taco Tuesday, we’re putting an unexpected twist on classic Mexican street corn — you know, that mouthwatering ear of grilled corn slathered with mayonnaise, dusted with crumbly cheese and chile. 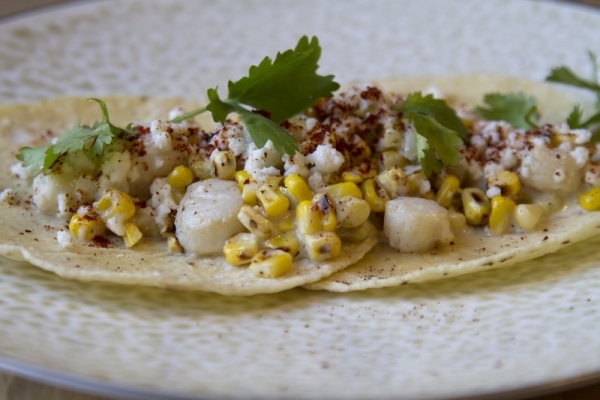 Today, we’re cutting the corn off the cob, introducing scallops into the fold and wrapping it into a tortilla. Sounds offbeat, I know, but you really, really have to try it. You’ll thank me. Instead of the grill, we’re using a screaming hot cast iron skillet to both char the corn and brown the scallops. Now comes my favorite part: a big ol’ spoonful of limey mayonnaise mixed into the corn-scallop mixture. 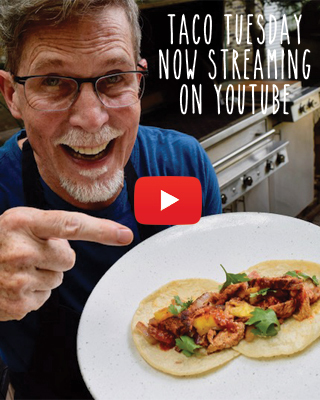 Scoop it all into tortillas, garnish with crumbled fresco cheese and powdered chile (I like guajillo), and you have one of summer’s best bites. Oh, a few leaves of cilantro are good here, too. In a large cast iron skillet preheated until extremely hot, place the corn kernels on half of the skillet and cook for about 5 minutes before turning. The kernels should char, leaving beautiful dark spots. Drizzle olive oil and salt over the scallops and place on the other half of the skillet. Sear for about 3-4 minutes, turn, then sear for another two minutes. Remove the corn and scallops to a large bowl and add the lime mayonnaise, mixing to incorporate. Scoop mixture into warm corn tortillas and garnish with queso añejo, guajillo powder and cilantro.